Three (3) taquitos prepared with mashed potato or chicken breast on corn tortilla accompanied with house salad and choice of salsa or cream. Lebanese-style Tabbouleh prepared with parsley, quinoa, tomatoes, cucumbers, green onions, lemon juice, olive oil, fresh spearmint, and romaine lettuce leaves. Prepared with whole-wheat Pita bread, yogurt, chickpeas, pine nuts, Tahini paste, olive oil, Kalamata olives, and spices. Prepared with veggies mix (zucchini, mushrooms, spinach, and Mozzarella cheese) or shredded chicken breast and Mozzarella cheese on whole-wheat Pita bread or flour tortilla with house salad and choice of salsa. Prepared with Mozzarella cheese on whole-wheat Pita bread or flour tortilla with house salad and choice of salsa. “Plátano Loco” filled with cottage cheese or black beans topped with cream. Lean Beef, Chicken Breast, or Organic Tofu. Mixed greens, tomatoes, cucumbers, and red onions tossed in house salad dressing. Romaine hearts with croutons and Parmesan cheese tossed in Caesar dressing. Tomatoes, cucumbers, red onions, green peppers, greens, Kalamata olives, and Feta cheese tossed in house salad dressing with whole-wheat Pita bread. Nappa cabbage (won bok), green leaf, red pepper, and red cabbage with wonton skins and house salad dressing. Side of basmati or brown rice. Chicken Breast, Organic Tofu, or Mushrooms. Latin American traditional soup (24-ounce) prepared with freshly-cut zucchini, potato, carrots, green beans, greens cabbage, onions, and cilantro. Hominy soup (24-ounce) prepared with green leafy vegetables salsa and spices. Served with cabbage, onions, radishes, lime, oregano, and tostadas. Chinese traditional soup (24 ounces) prepared with freshly- cut baby bok choy, won bok, ginger, shallots, and garlic. Lean Beef , Chicken Breast, Mozzarella Cheese, Mixed Vegetables, Mashed Potato, Organic Egg, or Organic Tofu. Peruvian entree with Chinese influences (chifa). Lean beef, chicken breast, or organic tofu tossed with tomato, red and yellow peppers, red onions, and homemade French fries. Served with steamed rice (white basmati or brown) and house citrus salsa. Lean beef, chicken breast, or organic tof stir-fried with tomatoes, onions, and red and green peppers. Served with Mexican-style rice (jasmine), beans (pinto or black), and choice of house salsa (mild, medium, or hot). Rolled corn tortillas stuffed with shredded chicken breast, Mozzarella cheese, or mixed vegetables (organic tofu, mushrooms, zucchini, and spinach) topped with green or red salsa and cheese. Served with Mexican- style rice (jasmine), beans (pinto or black), house salad, and choice of house salsa or cream. Choice of plain nopalitos with organic tofu or organic egg. Served with Mexican- style rice (jasmine) or brown rice, beans (pinto or black), and choice of house salsa (mild, medium, or hot). Three (3) rolled, hard-shell corn tortilla filled with shredded chicken breast or mashed potato. Served with Mexican-style rice (jasmine), beans (pinto or black), house green salad, and choice of house salsa (mild, medium, or hot) or cream. 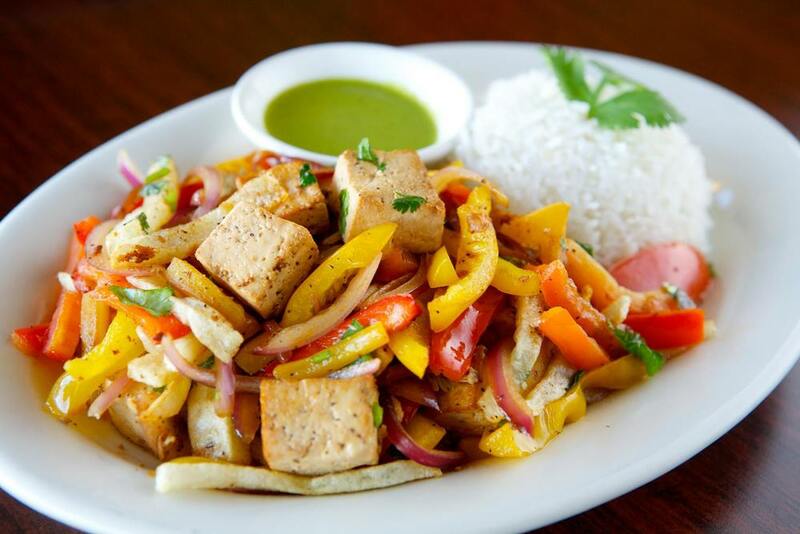 Grilled chicken breast or organic tofu seasoned with fresh lemon juice and spices. Side of rice (white basmati or brown) and sautéed broccoli, zucchini, carrots, and choice of house salsa (mild, medium, or hot). Flavorful dish from North India. Curried chickpeas prepared with fresh tomatoes, onions, cilantro, and various herbs. Served with rice (white basmati or brown) and Raita (yogurt, cucumber, and spices). Ghormeh Sabzi Persian herb stew. Sautéed herbs consisting of parsley, green onions, cilantro, spinach, and fenugreek greens (shambalileh) cooked with kidney beans and dried lemon. Served with rice (white basmati or brown). All soft tacos accompanied with Pico de Gallo and homemade salsa. Black beans, sweet corn, green beans, and peas. 2-ounce choice of Mozzarella, Parmesan, or Feta cheese. Ask for our 16-ounce fruit drinks of the day from watermelon, cantaloupe, mango, raspberry, strawberry, or guanábana. Mango, yogurt, and honey 16-ounce drink. 8-ounce cup with choice of half & half, coconut milk, and almond milk. grass, horsetail, linden flower, green tea, and jasmine. “Plátano Loco” filled with or mango jam. En 'Vida Sana con Cecilia', descubra deliciosos platillos, como las enchiladas, que se ajustan a esta dieta saludable. Primer Impacto. Lifestyle reporter Mar Yvette features the LA Taco Festival on Fox 11 News and Good Day LA (08/03/2012).